How many Miles per Gallon does your building get? – thomson | architecture inc. 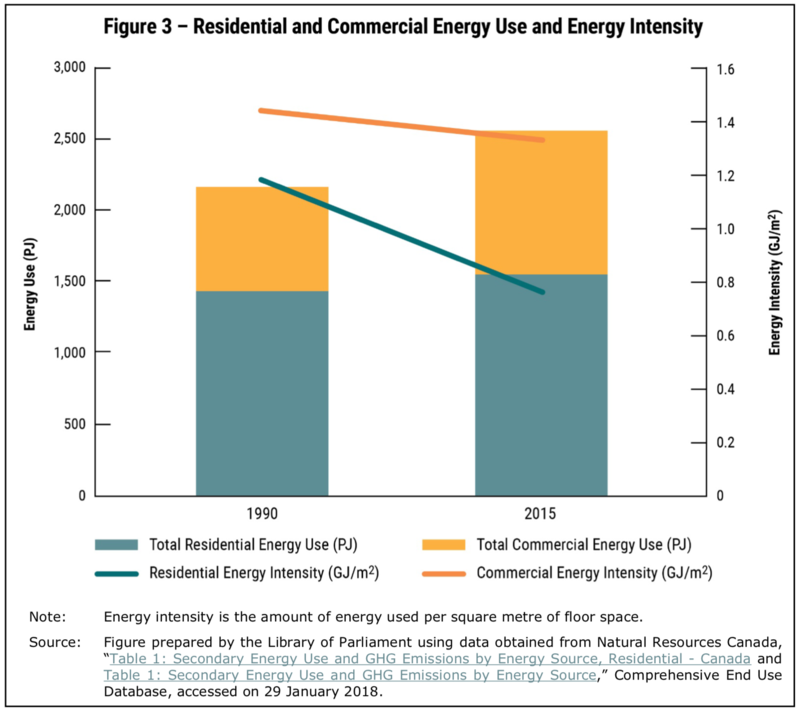 Above is a chart comparing energy use by source for a range of buildings in Canada, the latter 4 being projects in our portfolio. This represents the type and quantity of energy used per unit area of the given building, which we call Net-TEUI or Net Total Energy Intensity, as a function of building unit area. We have placed the least harmful (GHG potential) on the top of the stack and the least harmful on the bottom. OK, so buildings don’t move of course, but the funny thing is we have an easy way to evaluate energy performance when we buy a car – why not buildings? 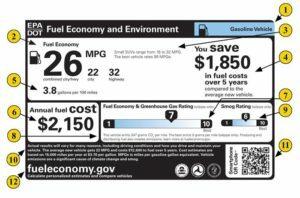 Even the flawed Miles per Gallon Standard has been around for at least 100 years, albeit only officially imposed since 1975. And improvements to measurements means that now we can compare direct energy costs of one vehicle to another, even when they use different fuels (ie. Electricity). 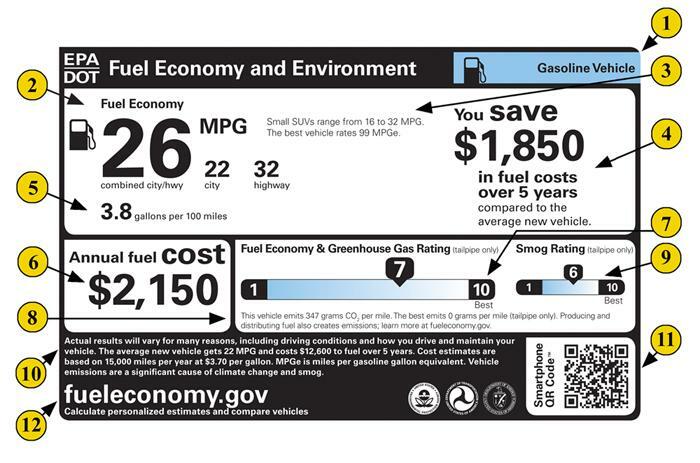 You can see the interactive version of this label at the EPA website here. But when we buy a home – why do we never see such a label? Prudent buyers will ask to see a history of energy bills, if they are available, but in most cases this is an afterthought. Why don’t we have a mandate for the same kind of standards for buildings in Canada? Well, we do (Energuide), but it’s merely voluntary. In fact, the Canadian Home Builder’s Association (CHBA) in a recent Senate report even goes so far as to claim that anything but voluntary standards will harm housing affordability. The crazy thing about this statement is that it takes me far less time to evaluate the actual and/or projected energy of a given house than it did to write this article – a couple of hours tops. No big deal. Another problem is that due to a vacuum in government leadership the number of competing proprietary standards has multiplied (Energuide, LEED, Passivhaus, R2000, etc.). Is one better than another? How is the public to know? On a visit this year to the Venice Biennale of Architecture, I was surprised and amazed to see that even in Italy, with its relatively mild climate, there is an energy rating for every building listed in every real estate broker’s window. 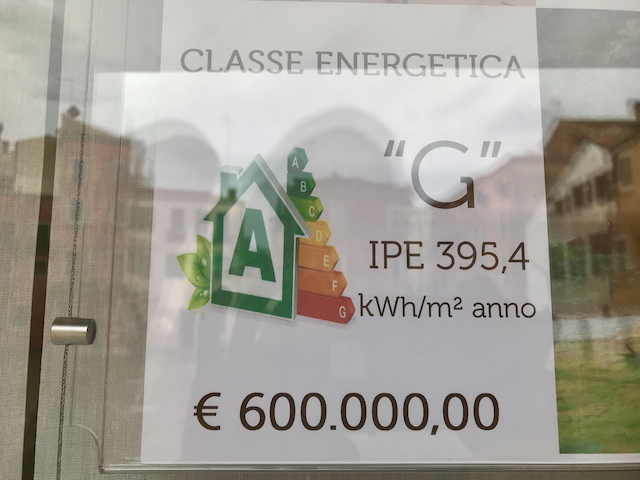 The ‘Classe Energetica‘ that gives a building a rating from a G (worst) to an A (best). But what is really awesome is that the TEUI is given. TEUI means Total Energy Use Intensity, which takes the sum of all energy used in its various forms, converts this to a common energy unit denominator, and divides these units as a function of building area – in this case, in square meters. To list a house, a simple form must be completed citing areas and energy bills. Easy peasy. In fact, the Ontario Association of Architects has recently responded to Ontario’s request for Climate Plan solutions, see point 5 here concerning Energy Disclosure and Data which a key part of the dialogue. In Canada, we have ready access to this kind of data for the wider population, if not yet for individual homes or other buildings. 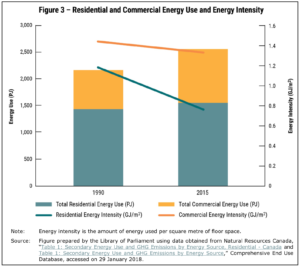 Here at Natural Resources Canada you can see data from 1990 to 2015 in terms of Energy Use Intensity in the Residential Sector. While the units are in GJ/m2, these can be easily converted to the more common Kilowatt-Hours (kWh) by multiplying by 278. So if you take the example of our lousy Italian House with barely a G grade at 395.4kWh/m2, and compare this with the National Average TEUI for a Canadian house – we see we have 327.78kWh/m2 in 1995, and a pretty good improvement in 2015 to 211.11kWh/m2. 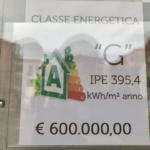 Classe Energetica – TEUI as seen in a Realtor’s window in Italy, 2018. Now I think most of us can agree that our planet is in serious peril. And to avoid the worsening destruction wrought by our imbalanced climate system, most scientists and countries have agreed that it is paramount to limit our emissions of CO2. As an architect, it is easy to see how this is not only possible and desirable but that doing so creates jobs, makes buildings last longer, improves comfort and best of all, reduces your energy bills! So why does taking action seem like such a bloody uphill battle? Well, before railing on about the similarities in tactics between the tobacco and the oil industries, which appear to be in full force, I think first of all most consumers just don’t have an easy framework to make good decisions. All I can say is that this ought to be a primary focus of the federal government to introduce an energy benchmark standard, based on TEUI for all buildings, nationwide, without exception. Then at least the ‘free hand’ of the market can make informed choices, which at present, it simply cannot. Then we can look at how much better we can do with new buildings, and with deep retrofits to existing buildings. In my own practice, our first passive Solar lodge building of 250m2 clocks in at 12,196kWh/yr, so that gives a TEUI of 48.78 kWh/m2/yr. This economical structure uses only 23% of the National Average for residential construction. How would you like to pay only 23% of your current gas and electricity bills? If you are thinking, “Sign me up!” then contact an Architect today to help you understand just what you can do to make your home, more comfortable, better performing, and longer lasting. And write your MP to demand a National Energy Rating and your MPP to demand support of the OAA’s recommendations! 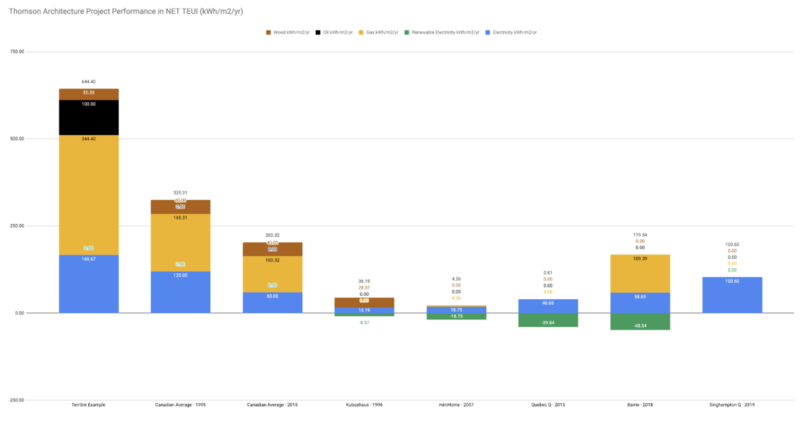 Linked here is a live google chart of some of our own energy benchmark tool that we have field data for as compared with the National Averages. To calculate the TEUI of your own building – try our calculator here. Oh – and to match the chart at the top of the article, here is the mirror of CO2e – or the Carbon Footprint of the same respective projects. What should be noted is that we aim on every job to be as close to carbon neutral as possible.